Would you blink if you saw a Weeping Angel? If the answer is yes, then be careful when you pick up this week’s copy of Doctor Who Adventures. There are a couple of dangerous Weeping Angels on the cover – plus a free spinning Angel and stickers for you to play with. You can also find out who came top of the Doctor Who Adventures 2008 villain poll. Who do you think it was? We’ll give you a clue. He’s mad, bad, and he likes Daleks. o What if? : Crazy things in parallel universes! o Game: Escape the Ood in this week’s cool game. o Tales from the TARDIS: Martha is kidnapped by the Hath. o Sarah Jane Adventures: An interview with Thomas Knight, who plays Luke Smith plus a preview of The Mark of the Berserker episode two. o Puzzles and time teasers: Get your brain in gear! o Ultimate Guide: Mini mag about the TARDIS. o Comic strip: A new adventure for Doctor and Donna, the first part of Time Flies. o Bloodtide and Doomfinger’s woven word whirl: Solve the puzzle and win a pop-up Dalek book! o Subscription offer: Subscribe today and get a DVD box set of the complete first series of The Sarah Jane Adventures. 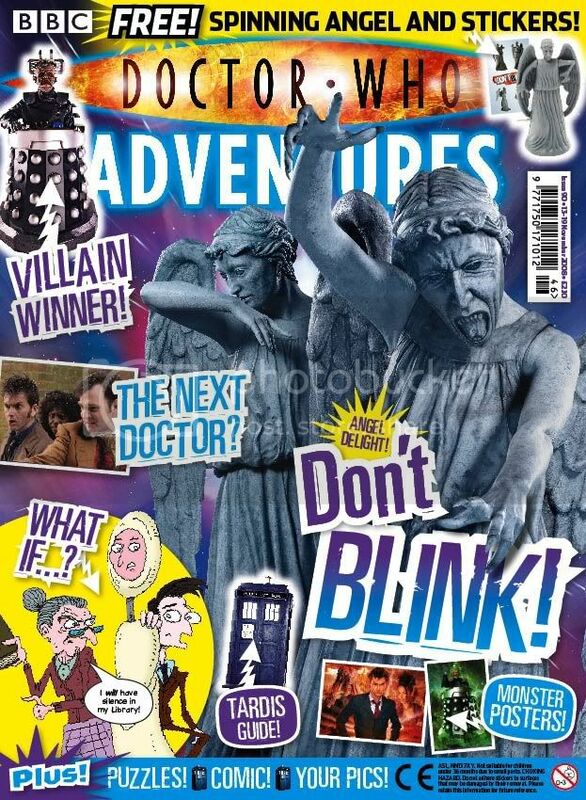 Doctor Who Adventures issue 90, priced £2.10, is out now. Try not to blink! This entry was posted on November 17, 2008 at 4:03 pm and is filed under Doctor Who Adventures. You can follow any responses to this entry through the RSS 2.0 feed. You can leave a response, or trackback from your own site.